Original design. This study in color is also a study of drafting a 10 pointed star. For me drafting quilt patterns is one of the most rewarding parts of designing a geometric quilt. 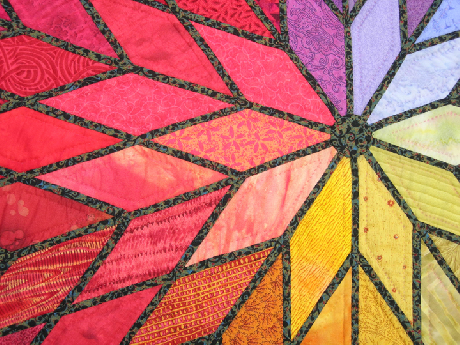 I like the way the color dances in this quilt. It almost moves. All 1/4" strips are appliqued and the only construction sewing on the quilt top. 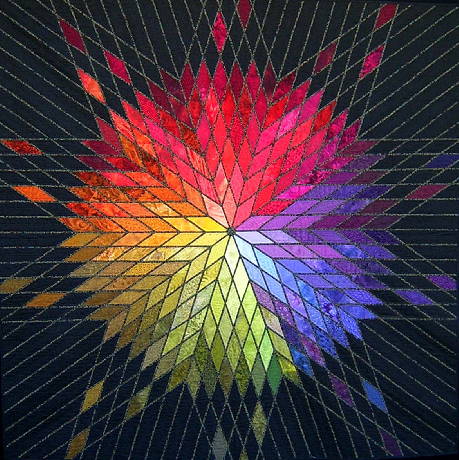 A total of 70 quilting threads were used to match every diamond color exactly. Hand applique and hand quilted. 100% cotton fabric, batting and thread used. 2006 IHQS- Indiana Heritage Quilt Show, Bloomington, In.